While there’s some evidence that other plants from the genus “Rhodiola” may have similar effects, you want to rely on the std. exctracts from “Rhodiola Rosea” that were used in several studies if you want to try it | for dosage recommendation, see bottom line. No? Well, I remembered “Rhodiola Rosea”, as I should have written before to avoid confusion with other plants from the same genus, when I saw a recent post by Jason Cholewa on Facebook. The link to a study that was attached to the post didn’t just remind me of this almost forgotten herb (ten years ago it was used in many more ‘kitchen-sink supplements’ than today); It drew my attention to a recent paper by scientists from the Samford University in Birmingham, USA (Ballmann 2018). Summary of the study design: The study tested the effects of a standardized (3% total Rosavins and 1% total Salidroside | NOW Foods) Rhodiola supplement or placebo on anaerobic performance of 11 trained, college-aged female subjects by the means of 3x15s Wingate tests (watch video) in a blinded, randomized, and counter-balanced manner. The supplement was administered thrice a day for three days (3x500mg/g) and once 30 minutes before the warm-up/testing procedures (1x 500mg/d). Each 15-second all-out-pedaling bouts during the Wingate test was followed by a 2 minute active recovery rest period, in which subjects pedaled at their own pace against an unloaded pedal resistance. The good news is: While it is a special product that is standardized for 3% total rosavins and 1% salidroside, you can, much in contrast to a dozen other promising herbal supplements, buy it (almost) everywhere – even the exact product that was used in the study at hand, i.e. NOW Food‘s 500mg caps which go by the simple name “Rhodiola”. This makes the study at hand particularly interesting for you, me, and everyone else who’s always on the look-out for safe and still functional performance boosters that are actually available on the market (vs. some exotic extracts you would have to order from a research supplier such as Sigma Aldrich). In that, it is not clear if a ‘loading phase’ as the scientists used it in the study at hand is even necessary. Other studies, I am about to cite later in this article seem to suggest that an effect can be seen immediately (~1h) post ingestion and evidence of a cumulative effect is – as of now – not available and warrants further research (see red box on potential anti-hormetic effects, too). Disclaimer: It may be important to point out that I am pretty sure that there are similar products from other manufacturers on the market (before you buy, make sure it’s standardized to at least 3% total rosavins and 1% salidroside, though) and that neither I nor the authors (at least according to their declaration in the full-text of their study) received any kind of compensation for mentioning NOW in our articles. It is thus very well possible that the actually measured effect in Ballmann’s study was due to the single 500mg cap the subjects took before the Wingate test. This, in turn, would imply that you would use Rhodiola in similar ways as caffeine or other (no longer available) stimulants like DMAA or ephedra. “So, I’ll take 500 mg 30-60 minutes before workouts, right? Won’t more help more? If this is not your first visit at suppversity.com, you should know by now that “more helps more” is as invalid for supplements and exercise performance as it has been shown to before money and happinesss (Easterlin 1973). Figure 1: In Noreen’s 2013 study, the provision of R. rosea at a dosage of 3mg/kg only once, 1 hour before the 6k-cycling trial, yielded significantly improved time-trial times (left) and reduced rates of perceived exertion (RPE | p = 0.04), as well as RPE/power (right | p = 0.007) compared to a carbohydrate placebo (adapted from Noreen 2013). Moreover, studies like Noreen et al. (2013 | see Figure 1) or Duncan & Clarke (2014) seem to suggest that an even lower dosage of 3mg/kg of the same standardized extract taken 1h before (in those studies albeit aerobic) exercise tests will have significant ergogenic effects, too. Overall, it has to be said, though that the optimal dosing strategy is still in the open, though, because: (a) we do not have any studies comparing different dosing regimens directly, and (b) we do not even know how Rhodiola Rosea does whatever it is, it does. If we knew (b), we could at least speculate about the optimal timing and potential dosing thresholds, but as of yet, there are only various unconfirmed and often disputed hypotheses as to how Rhodiola works. “Will the anti-oxidant effects of Rhodiola ruin my gains – keyword: #hormesis?” It is impossible to say whether the anti-oxidant effects of Rhodiola may impair your long-term gains, at this point. My educated guess however, would be that the answer to this question people ask me all the time is “no” – not the least because the creatine kinase (CK) and hence muscle damage in a 2004 study by Abidov et al. was not blunted by the provision of a supplement, of which the scientists say that it contained “30 mg active substances [rosavine, rosarine, rosine, salidroside, rhodalgin, acetylrhodalgin, rosiridine, and rosiridol]”, the levels only recovered significantly faster over the 5-day follow-up. A long(er)-term (=4 week) study, in which the Polish Rowing Team received 100 mg of a non-specified “R. rosea concentrate”, found increases in total plasma antioxidant capacity and a reduced superoxide dismutase activity in erythrocytes directly after and 24 hr after an exhaustive bout of exercise was also observed in rowers by Skarpanska-Stejnborn et al (2009) – both effects that are relatively unlikely to translate to a reduction in the adaptive response to exercise. Due to the fact that we’re talking about highly trained athletes, it is also not that surprising that the already marginal (and everything but statistically significant) increases in performance markers the scientists observed over time showed no inter-group differences. Needless to say that “additional research is necessary” (I know I hate this sentence, too 😉 to finally answer your question, but as previously pointed out, I consider it unlikely that the regular use of Rhodiola, in a similar fashion as caffeine, would have negative effects on your gains. These hypotheses include, most prominently, the ‘ATP hypotheses’. Unfortunately, researchers from the Air Force Research Laboratory (Walker 2007) found in their 2007 study that the significant increases in ATP-turnover/resynthesis that had been observed in a previous rodent study (Abidov 2003) doesn’t seem to occur in humans. Walker et al. (2007) had used the same dosing scheme as Ballmann, but relied on what I would call a pretty odd performance test: wrist curls. Be that as it may,… their measurement of the ATP kinetics by phosphorus 31 nuclear magnetic resonance spectroscopy, revealed absolutely zero effects of the rhodiola supplement – whether that’s simply due to the hardly exhaustive nature of the exercise protocol in this Air Force study, is not clear, but I certainly wouldn’t discard the possibility of muscle-physiological/-metabolic effects completely with high(er) intensity exercise, yet. The actual mechanism is not clear, but it could be of metabolic, muscle-physiologic or neuro-physiologic origin… or, obviously, a combination of all three! If we look for other potential mechanisms, the previously cited study by Noreen et al (2013) comes to mind. The scientists Gettysburg College found significant performance improvements, in this case, improved 6-km cycle times (Figure 1, left), they ascribe to a reduced perception of effort (Figure 1, right). Similar beneficial effects on RPE were observed by Duncan & Clarke (2014), who tested the effects of 3mg/kg BW in ten young men, who completed two 30-minute cycling trials at an intensity of 70% of VO2Max in a double-blind, crossover design trial. Together these two studies seem to suggest that – at least during endurance exercise – the mechanism of action could, in fact, be of central neurological vs. peripheral muscle-physiological nature. Since tests that would be able to confirm this hypothesis were not conducted in the Ballmann study, and the mean fatigue index (Figure 3, bottom right) was non-significantly elevated, not decreased, it does yet seem very unlikely that this is what triggered the beneficial effects Rhodiola had in this most recent study on the effects of Rhodiola on anaerobic exercise performance. Speaking of adaptogens: Ashwaghanda may be for gymrats, too | Human study showed significant body composition improvements in 2015. Could hormonal changes explain the benefits? You may remember the 2016 installment of the #ShortNews, in which I addressed a study showing significant increases in testosterone levels in response to 7x higher doses of a non-standardized Rhodiola product in exercise-trained mice (learn more). Rhodiola is also said to have cortisol-lowering effects – a claim that corresponding product write-ups try to prove by citing studies like Jurcău et al. (2012), or Ross et al. (2014), which did, however, not investigate the cortisol response to exercise but other forms of stressors. Studies that investigated the effects in conjunction w/ physical exercise found inconclusive effects w/ one study that used a combination of Rhodiola + carnitine showing a significant time, but no treatment effect (Muñiz-Pumares 2011). The same goes for the previously cited study by Noreen et al (2013), as well as a dose-escalation study in rodents that found no effect on either testosterone or cortisol of exercised mice on dosages of up to 300mg/kg (that’s already the human equivalent) of a mixed Rhodiola, Astragalus and Radix Paeoniae Alba extract (Chen 2017). Figure 4: Results from the study under review (Ballmann 2018) – Anaerobic performance outcomes compared from 1st, 2nd, and 3rd 15-second Wingate Anaerobic Tests (WAnT); Data are presented at mean ±SD; * indicates significantly different from 1st WAnT, # indicates significantly different from 2nd WAnT (p < 0.05). As far as the observed effects are concerned, it is worth mentioning that we’re talking about a cumulative effect, which occurred in the absence of significant effects in the individual 15s-bouts of all-out cycling (see Figure 4). This is in line with the previously hinted at observation that there are more ‘Rhodiola studies’ using aerobic vs anaerobic outcomes to gauge its efficacy; and, more importantly, that the former are also more likely to report performance increases than studies that used (ultra-)short bouts of high-intensity exercises, such as the 3x15s Wingate tests. 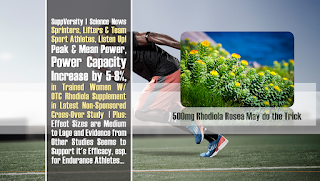 Even if Rhodiola was more of an endurance supplement, though, this would not change the results of the study at hand: There’s a statistically significant cumulative effect over “only” 3x15s high-intensity cycling bouts in the study under review, which thus provides convincing evidence that: Athletes competing in sports that require intermittent all-out sprinting or other forms of intermittent high-intensity exercise may benefit from standardized Rhodiola extracts. Figure 5: Graphical illustration of the relative improvements in mean and peak power (blue) and anaerobic capacity and power (orange) with Rhodiola vs placebo; all differences that are shown were statistically significant (p < 0.05) in the cumulative analysis (i.e. considering all three bouts) and the individual effect sizes (Cohen’s d) are provided in the captions.